Waterbird counts are exactly that: counts of the number of waterbirds present in one area. A team of trained and experienced counters spreads out through the Deep Bay area and counts small sectors simultaneously so as to avoid the possibility of double-counting or under-counting. 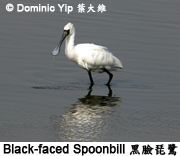 During the winter months, most waterbirds are found in Inner Deep Bay or on the intertidal mudflats there. For this area, where large flocks of birds are spread over a sizeable area, it is necessary for counts to be conducted from different vantage points using mobile phones to minimise the chance of error. 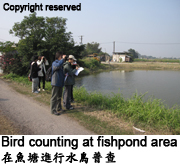 In addition to counting waterbirds, where possible, they are assigned to individual fish ponds, gei wai or streams. For each of the fish ponds other data in the form of the vegetation surrounding or inside each pond, the water level of the pond and how much mud is exposed are also collected. This provides information that, over the long-term, will allow a precise assessment of the factors influencing the number of waterbirds. It may then be possible to repeat the advantageous factors in other areas, and thus increase the number of waterbirds that Deep Bay can support. These coordinated counts are carried out once a month throughout the year. In addition, in order to monitor the special importance that Deep Bay has for two types of waterbirds, other counts are also carried out. Egrets and herons that feed in the Deep Bay area are also counted at their breeding sites so as to monitor their numbers and breeding success. Shorebirds, a specialised group of birds that feed primarily in intertidal areas and for which Deep Bay is of special importance, are counted regularly during the spring and autumn migrations. Copyright reserved. The Hong Kong Bird Watching Society.